The softness of Aria, combined with it’s unique changes in color & structure ‘spoke’ of a soft & elegant cowl. Adding a strand of Mini Solid adds depth to the color changes. 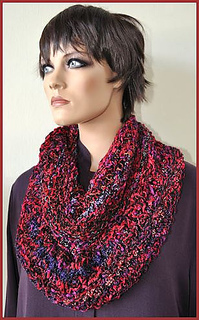 This long cowl can be worn long or doubled as shown in the photo.